Breaking away from the tradition of dealing with the technicalities of the regulation of financial reporting in a relatively unchallenging and uncritical way, Financial Reporting and Analysis focuses on the reasoning behind the rules. Affording sufficient detail on the application of standards to enable the reader to appreciate the effects of the rules, the logic behind them is portrayed in terms of the reasoning and history behind their development, giving students a more informed insight. For further details please visit the Instructor Companion Site. 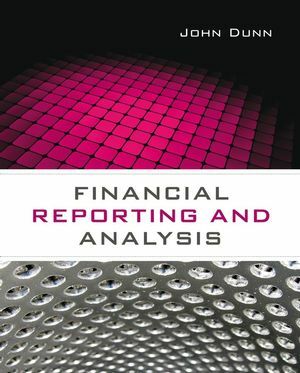 John Dunn is a lecturer in financial accounting, auditing and corporate governance at the University of Strathclyde. Prior to that he was principal lecturer at Napier University and a lecturer at Bell College of Technology. He is a member of the Institute of Chartered Accountants of Scotland and an examiner in financial reporting and advanced auditing for the Faculty of Actuaries and the Association of International Accountants. For further details please visit the Lecturer Companion website. Explains the meaning behind the rules of financial reporting, as opposed to just the implementation of these rules. The combination of sufficient practical coverage with an approachable scholarly framework will appeal to both students and lecturers. Website containing solutions to questions in the text, as well as additional questions and solutions.